NEW HAVEN, Conn. — Tennessee senior quarterback Joshua Dobbs has been named the Walter Camp National FBS Offensive Player of the Week, presented by Generation UCAN, as announced on Sunday by the Walter Camp Foundation. Dobbs earns the honors for the games ending Nov. 19. 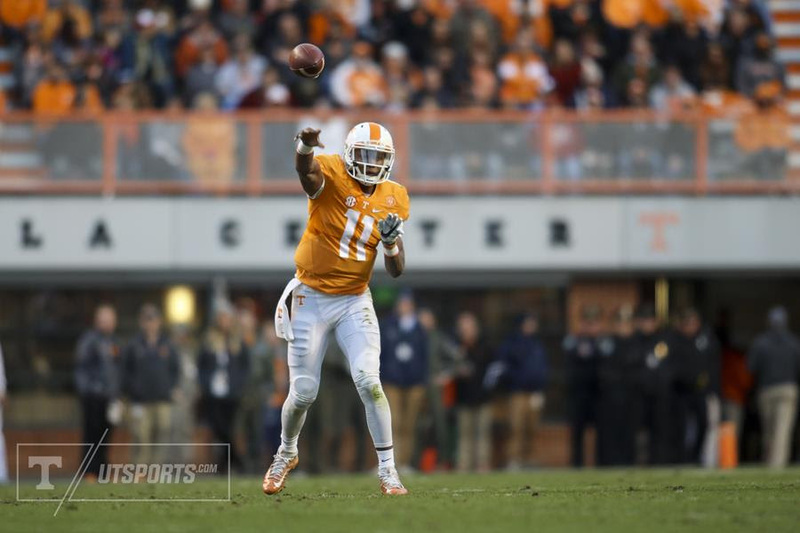 This week’s award marks the second time Dobbs has been named Walter Camp Offensive Player of the Week as he previously earned the award on Oct. 11, 2015. He is the fifth Tennessee honoree since 2004. Dobbs accounted for five touchdowns (three passing, two rushing), completed 15 of 22 passes for 223 yards and ran for a career-high 190 yards on 10 carries to lead No. 19 Tennessee to a 63-37 Senior Day win over Missouri on Saturday. With those five touchdowns, Dobbs now has 81 touchdowns accounted for (passing, rushing, receiving) in his career, tying Casey Clausen for second-most in Tennessee history.